Everything unraveled when Kisha Howard’s mother had a stroke. First it was the trips back and forth from Howard’s home in Orlando, to take turns sitting with her mother in the hospital in Daytona Beach, Florida. The gas added up, as did the meals she grabbed from fast-food restaurants during the hourlong drive each way after work. Then it was the paperwork. Her mother was already living on a fixed income back in Orlando. So when she returned home and medical bills started coming in, Howard started to panic. Her mother needed medication and home health care supplies. Howard was single and had her own bills to pay. And as the oldest of three, she felt like she couldn’t continue to ask her brothers — who both had families — for money. So she took out a payday loan. And then she rolled it over into another one. Situations like Howard’s are more common than you might expect. Payday loans are what about 12 million Americans turn to each year for short-term financial help. People who don’t have four-year degrees are more likely to take out payday loans. So are African-Americans and people who earn less than $40,000 per year. If you’re divorced or rent your home, you could be more vulnerable to the payday loan industry, according to Pew Charitable Trusts. But you know who uses payday loans the most, according to Pew’s data? White women between ages 25 and 44. Demographics aside, the feeling of being in a financial jam that’s making you hyperventilate is universal. If you’re not sure who to ask for help, sometimes you pick the stranger at the counter of the check-cashing store down the road who gives out payday loans, thinking everything will be fine when you settle the debt in a week or two. But for some, asking for a short-term loan doesn’t really provide a quick fix. Instead, it’s a cycle of debt that can trap borrowers for far longer than the next pay cycle. What Are Payday Loans and Why Are They So Complicated? You only need three things to get a payday loan: identification, a job and a checking account. When you go to a payday lender to request a loan, you fill out a brief application and, in most cases, walk out with the money you need to tide you over until your next paycheck. No credit check. No collateral. In a 2013 study, the Consumer Financial Protection Bureau (CFPB) found that the median fee on a typical 14-day loan was $15 per $100 borrowed. Take out the median payday loan amount of around $350, and you could expect to pay $50 to $55 just to get by until payday. The lender automatically dings your checking account for your loan balance on your next pay date. This is fine, if your direct deposit hits before your payday loan withdrawal. If your loan repayment overdraws your account, you face overdraft fees from your bank and additional fees from your payday lender. What happens when you can’t repay the full amount of your payday loan? Some lenders allow borrowers to roll the balance to a new, larger loan under the same fee schedule. Those longer loans can have an annual percentage rate of almost 400%. When you consider that a credit card may have an APR of 15-25%, it’s hard to imagine why anyone would take out a payday loan instead of using a credit card. But for many, payday loans aren’t just the last option. They also may be the only option. Payday lenders have long had a reputation of being predators who trick people into taking out loans they can’t afford from sleazy shops. TV commercials for online payday lenders promise the ease and availability of loan funds while portraying smiling, carefree people. People who’ve never taken out a payday loan before might assume that borrowers are irresponsible spenders who can’t manage their money. It’s not that simple. Here we are in the nation that appears to have difficulty scraping together cash for an unexpected $400 bill. One in three people don’t have any savings to turn to in a financial emergency. Getting credit is simply out of the question for some, and it’s not just a matter of having a bad credit. An estimated 11% of American adults are credit invisible — they have no credit history for credit reporting agencies to score. Regardless of personal credit history, payday loan users seem to be aware of the high costs. Dan Raciazek, a government contractor in Washington, D.C., needed some cash this spring, so he took out a few small loans adding up to about $1,000. He used an online payday lending service he saw on a TV commercial, which even has an app so Raciazek can track what he owes and when. The fees for those loans added up to $411. And for his short-term need, a payday loan seemed like the best option. If you’re taking out low amounts, he said, you can get through a tough time without risking damage to your credit score. “Your credit is worth a lot more than $100,” he said. He doesn’t recommend payday loans, but he understands the struggle of many who turn to them. “It’s better than getting evicted,” he said. While 16% of those surveyed by Pew in 2012 said they took out a payday loan to weather an unexpected expense, 69% reported using payday loans on recurring expenses like rent, food or utility and credit card bills. Those everyday expenses combined with the unexpected can make for some pretty tricky money decisions. Heather Devaney of Nashua, New Hampshire, was excited when she got a job offer after being out of work for a while. Her new job paid well, but there was one problem: Devaney needed to move to a new apartment, and she didn’t have cash for the security deposit. Feeling stuck, she turned to a payday lender who fronted her the money she needed until income started coming in from her new job. “It was expensive, but very helpful in my time of need,” she said, looking back on the experience. Taking a payday loan when you need it doesn’t seem too dangerous if you think it’s going to be a one-time stopgap. But those who are trying just to make it from paycheck to paycheck are most likely to get into a cycle of payday loan turmoil. The CFPB claims that almost 70% of payday borrowers take out a second loan. Even scarier: “One in five new borrowers ends up taking out at least 10 or more loans, one after the other.” The average repeat borrower pays $450 in fees on top of their principal over the course of a year. That’s what happened to Lynn, who asked us not to use her last name. While living in Michigan between 2011 and 2014, she was laid off from her job. When she finally found a new job, it was for a lower salary than the job she had lost; meanwhile, she still had a car payment, and her rent was increasing. She knew that payday loan interest rates were high, but a late payment fee for rent or other bills would cost her even more. So she took the loan. Wages aren’t keeping up with the rate of inflation. Meanwhile, tight purse strings since the recession have made it harder to access credit through your bank or a credit card servicer. Servon has spent years studying the financial situations of payday borrowers and has noticed many of them have kept their payday loan use a secret from family and friends. In some cases, Servon is the only one they’ve told. For many, payday loans serve as a last-ditch effort to stay afloat. Howard, who works as a loan processor for a mortgage refinance company, tried to reel in her finances while she sorted through her mother’s medical paperwork and attempting to make payment arrangements. She finally got out from under those payday loans by cutting back on expenses and making arrangements for many of her household bills. She was even able to skip a month on her car payment. “Most people try to duck and dive” phone calls about their bills, she said. But being proactive made billing departments want to work with her. Fourteen states and Washington, D.C., have made short-term, high-interest loans illegal. In three of those states — Arizona, Montana, and Ohio — the decision went on the ballot for the public to decide. Many of the states that have outlawed payday loans have done so by capping interest rates on all loans at 36%. With payday loans more difficult to access in many places, people are turning to other options that have similar risks. If you have access to credit, you can get a traditional installment loan from your bank. But if you have bad or no credit, there are plenty of places that promise “speedy” and “express” cash that will give you a loan with an interest rate that might skirt the cap set by a payday loan ban. Without a credit check, the lender has no idea whether you can really afford to be tied to a loan for the next few months or years. If you have anything left to sell, there’s always a pawn shop. You don’t need a bank account, or proof of employment, or a credit check. Trade in your goods, walk out with cash, pray you’ll have enough money to get your stuff back when the loan is up. But in most of the country, it’s still easy to fall into a payday loan cycle. In June 2016, the Consumer Financial Protection Bureau proposed new rules for payday loans that would prevent financially vulnerable consumers from getting into a cycle of debt. The CFPB proposed that lenders determine the borrower’s ability to repay in full without reborrowing before granting a payday loan. Lenders could also grant loans for greater than two weeks if they provide less risk for the borrower, such as capping interest at 28%. Organizations such as People’s Action Institute and Americans for Financial Reform are pushing for short-term loan options that favor consumers, both via the CFPB and beyond. 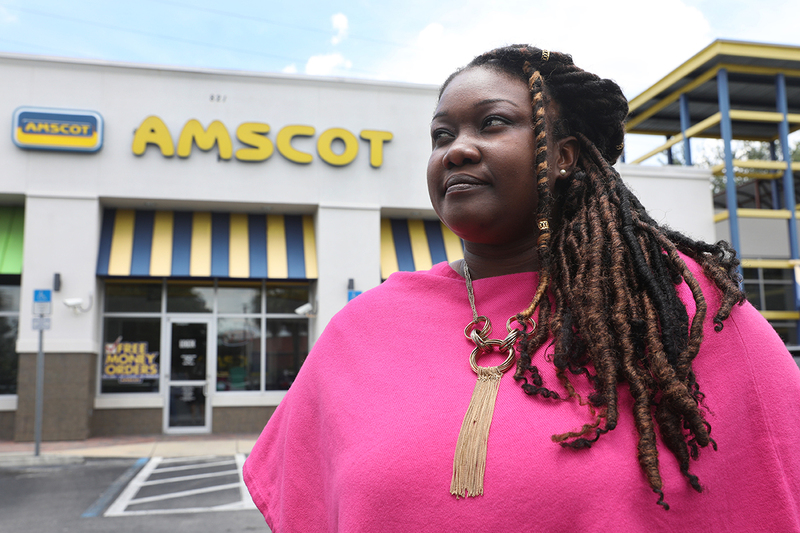 In the meantime, Servon hopes her long-term research about individual experiences with payday loans can shed light on the cause-and-effect cycle that can drive payday borrowing. “We can find ways to protect people at vulnerable moments,” she notes in “The Unbanking of America.” In the book, she recommends financial service providers present information more clearly to consumers to help them make better decisions for their own financial health. Progress has been made in this area, she says, but a lack of consistency across the industry makes comparing options more challenging for customers who may feel overwhelmed by the information presented to them. For now, the decision to take out a payday loan remains deeply personal.